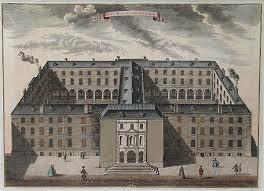 Guy's Hospital by John Stow 1755. James Mc Manus had an uncle who managed a Sugar Plantation in British Guinea where he possibly met the Reverend Leonard Strong, a Church Missionary who held an Estate of 926 acres in the Parishes of Bohola and Killedan during the mid-19th century. He bequeathed the Killedan Property to his son-in-law, James Mac Manus during 1853. This James (Emily’s Grandfather) married his daughter Charlotte Strong. 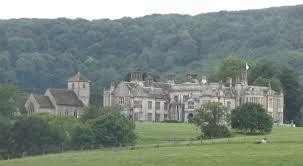 The family home Killedan had originally been the in the property of the Taffe Family. 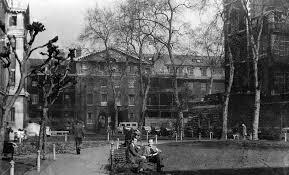 Emily Mc Manus began her training at Guy’s Hospital aged 22 years during 1908. At the beginning of WW1 during the Spring months of 1915 she travelled to France as a Nursing Reserve Sister at Etaples where she spent three years. Following her return from duty she worked at Guy’s Hospital. She was later appointed Matron of Bristol Royal Infirmary prior to returning to Guy’s Hospital as Matron with a staff of 800 during 1927 until her retirement during 1946. She was elected to the Nursing Council of London for five years. She travelled to many meetings while retired. Emily McManus built a Lakeside dwelling at Terrybaun, Pontoon as her beloved Killedan was closed when she retired to Ireland. She was a regular figure in her Morris Minor around the narrow roads also a friendly person with her upper class accent and tweed outfits she enchanted all whom she encountered! She loved birds; or to fish on nearby Pontoon Lake, she competed in the Castlebar and District Trout Anglers Annual Fishing Competition on Lough Conn during June 1947. She delivered a talk on her “Caribbean Journey” plus her celebration of the Persian New Year at Tehran to members of the Mayo Historical Society at the Vocational School Castlebar during 1960. On May 23rd 1966 Emily Mc Manus appeared as a “castaway” on the BBC Programme Desert Island Discs! In 1967 Emily McManus recounted her war-time experiences; also she appealed for more financial assistance at the Annual General Meeting of the Mayo branch of the National Council for the Blind in the Welcome Inn Hotel, Castlebar. She loved to read especially the War Poets. Unusually she had a passion for the goats she reared at her home! 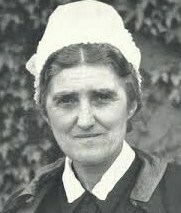 In her memoirs entitled “Fifty Years of Nursing – Matron of Guy’s” (published during 1956 with a preface by her cousin L.A.G. Strong) Emily Mc Manus discussed various anecdotes of the war years plus events in France; The Blitz in London in 1940 plus the evacuation of Guy’s Hospital. She mentioned the responsibility of nurses to create homeliness in the” midst of the mud and blood, dust and death, in which they spend most of their days” plus the troops who marched to the battle front and returned as invalids, the Australian Band members who perished when their hut got a direct hit. The book included many photographs of France in W.W.1. plus the Red Cross Ambulances wading through mud, a makeshift operating table with surgeons also rows of invalided soldiers. [i] Kilkelly, Sheila. Interview. April 2013. [ii] Kilkelly, Sheila. Interview. April 2013.